Some of the large global organisations that have taken an interest in the airport sector for investment purposes are starting to follow in the footsteps of the smaller, more regional ones, which used to be involved in it but stood down or reduced their attachment. But for every action there is an equal and opposite reaction, and the wave of interest from pension funds in particular appears to be as hooked as ever on airports, now supplemented by insurance companies and other financial institutions that are seeking a piece of the action – especially in Europe. This report deals with one such case: the projected sale of equity in a European airport by an Australian-based fund manager, potentially to one or other Canadian pension funds supported by European finance houses with no experience of the sector. Another Canadian pension fund may make a bid for a stake in Brussels Airport. Other financial institutions with no experience of the sector are joining forces with such funds. Brussels is a good investment for those seeking ‘riskless’ stability, but risks come in many forms. The seller, the Macquarie Group, is a net disposer of airport assets right now but retains an interest in the sector. Reports suggest that Ontario Municipal Employees Retirement System (OMERS) is looking to acquire a 36% stake in Brussels Airport. OMERS will compete with various other financial sector entities for a share in an airport that has gained hugely in gravitas and services several very high profile international organisations such as the European Commission (and the administrative paraphernalia that goes with it), the Benelux Secretariat and NATO. The stake is valued at between EUR1.5 billion and EUR2 billion. The current ownership is as follows: the owner and operator is Brussels Airport Company NV/SA, composed of Ontario Teachers Pension Plan (OTPP) (39%), Macquarie European Infrastructure Fund I and Macquarie European Infrastructure Fund III (36%), and the Belgian State (25%, since 2011). It was during 2017 that the Macquarie Group appointed JP Morgan to market its 36% stake in the airport. Ontario Teachers' Pension Plan (OTPP) was then reported to be interested in the stake. OTPP has pre-emptive rights to acquire the 36% stake as OTPP has owned 39% of Brussels Airport Company since Dec-2014. However, OTPP and Macquarie were in dispute about information sharing for other prospective bidders for Macquarie's stake. That dispute was resolved in Apr-2018, permitting Macquarie to begin the sale of its stake. Then, in Sep-2018, Belgium's Flanders Government was reported to be considering the acquisition of Macquarie Group's stake in the airport through Flemish Government investment company PMV, which would partially renationalise it. Nothing more has been heard of that proposal. Since then, apart from OMERS, other organisations and consortiums have entered the fray. OMERS will compete with a consortium formed by APG and QIC. The former manages the pension assets of approximately 4.5 million Dutch citizens and invests in fixed-income securities, property, hedge funds, private equity and infrastructure. It is the part-owner of Belfast George Best City Airport in a consortium led by the 3i Group and including ATP, the largest Danish pension firm. The latter, QIC, is the Queensland Investment Corporation, established in 1991 by the Queensland Government to manage its long term investments and now the third largest institutional investment manager in Australia. It has one airport asset: Brisbane Airport. A second consortium has also sprung up, comprising the Canada Pension Plan Investment Board (CPPIB) and PGGM, a privately owned Dutch investment manager covering pension funds, public equity and debt markets and private equity, real estate funds, commodities, and infrastructure markets across the globe. Earlier, in Nov-2018, it was reported that PGGM aimed to form a consortium with Allianz, AG Insurance and Canada Pension Plan Investment Board to bid to acquire Macquarie Group's 36% stake. As it happens, Allianz appears to have dropped out, leaving CPPIB and AG Insurance, a Belgian insurance company, as the other members of this consortium. These developments are symptomatic of two factors. Firstly, the increasing propensity of financial sector investors to dabble in airports, beyond the well established players – mainly pension funds – from Canada (such as OTTP, CPPIB, OMERS etc.) and Australia. However, it is rare that these new entrants choose to ‘go it alone’, usually preferring to attach themselves to the coat tails of the established organisations. Secondly, how these funds are increasingly involved with high volume, full service airline-dominated major city airports at different levels, often allowing existing management to continue in situ while retaining an arm's-length diligence function. So what do they see in Brussels Airport? BRU appears to have recovered operationally from the terrorist attack of Mar-2016, almost three years ago. Passenger traffic fell by 7% in that year, the same margin it had grown in the previous year. Then it increased by 13.6% in 2017, but by only 2-3% in 2018 and 2019 to date. Capacity has been added in every year since 2014, and in the case of cargo capacity, since 2017. DHL has a major hub there. Source: CAPA - Centre for Aviation and Brussels Airport reports. Yet, with 25.6 million passengers (2018) Brussels Airport is smaller than European provincial regional airports such as Düsseldorf and Manchester. 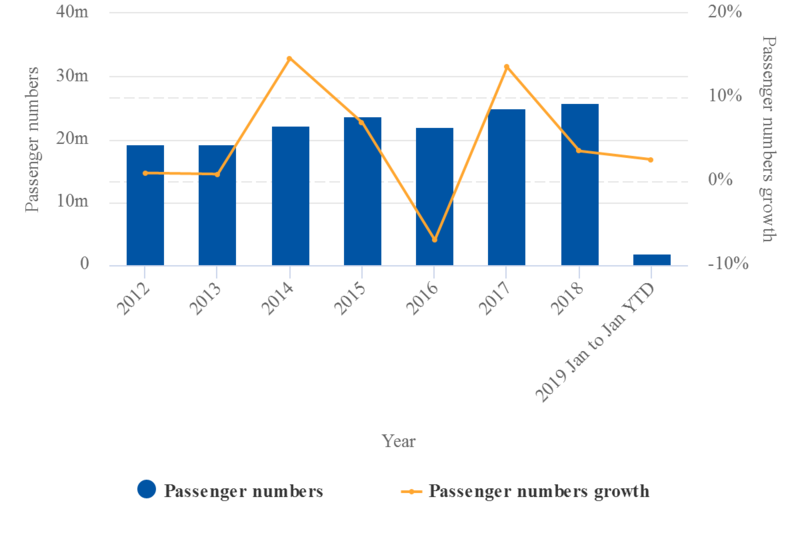 Brussels Airlines is dominant, with almost 40% of seat capacity and between 33% and 43% of movements, depending on the time of day, but that is not taking ‘dominance’ to extremes. Low cost airlines, led by Ryanair – which has a major (and its first-ever international) base at nearby Charleroi Airport – has risen to 18.8% of capacity, giving BRU a better traffic mix, but the investors will be attracted more by the four fifths of capacity held by full service carriers. 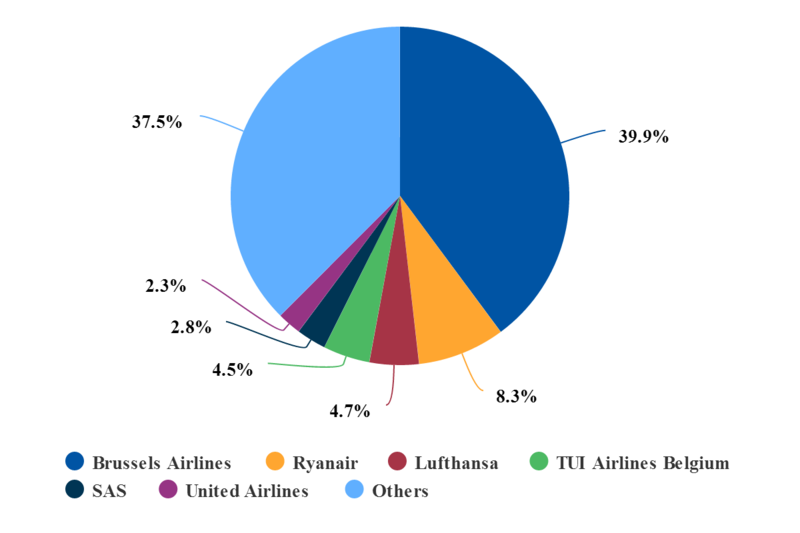 The network aspect of the airport is further reflected by the fact that only 27% of capacity is on unaligned carriers, whereas Star Alliance, which includes Brussels Airlines, has 61%. There is an early hours curfew but otherwise, during operational hours, there is a close to perfect symmetry on most days of the week between arriving and departing capacity, which suggests a well oiled hub operation. The airport is in the middle of a USD600 million master plan development through to 2020. Taking these factors into account, together with the economic and political prominence the city has (although the long term future of the European Union and its Brussels-based Commission of 32,000 staff – and everyone else based there because of it – grows less certain just now) BRU is an easily identifiable location for funds wishing to benefit from stable traffic flows without undue risk. As for Macquarie, it is in a strange place at present. It has already disposed of its holding in Copenhagen Airport (2017) but retains a 50% share (with Ferrovial) in the Glasgow, Aberdeen and Southampton airports in the UK. This suggests the Group is edging away from the airport sector just as Macquarie Airports did, but it was an unsuccessful (consortium) bidder for the Fukuoka Airport concession in Japan and is still in the frame for the lease of Westchester Airport in New York State Macquarie (if that ever happens).